This work was inspired by the artist's desire to make a personal contribution to the memory of the Holocaust. 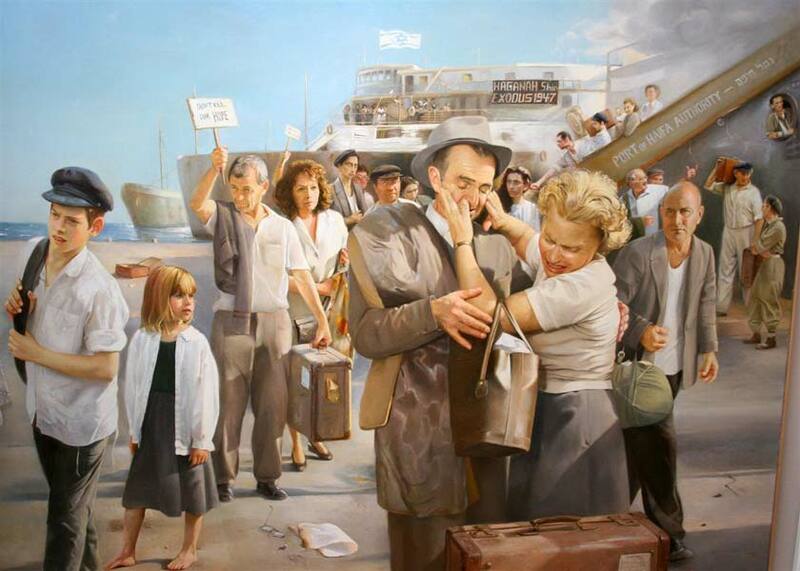 The ship ''Exodus'' is a symbol of suffering--the tumultuous journey across the Atlantic representing the vicissitudes and vulnerability of the Jewish people without a home. 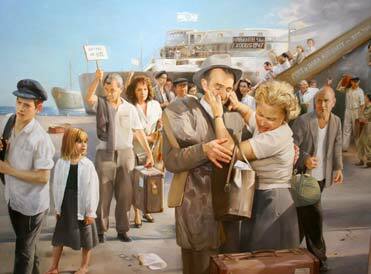 The foreground of the canvas is dominated by the moving reunion of the couple who had been separated in the concentration camps. Each believing the other had not survived, they are unable to make eye contact, hardly daring to face the reality before them. Although their eyes are averted from each other, they tentatively touch one another seeming to relive the agony of separation and the agony of reconciliation simultaneously. The men women and children pouring out of the ship have a dazed and dream-like expression. They seem to focus on something further away than their immediate surroundings, on a dream of a future of hope that will be always haunted by the nightmare of the past. 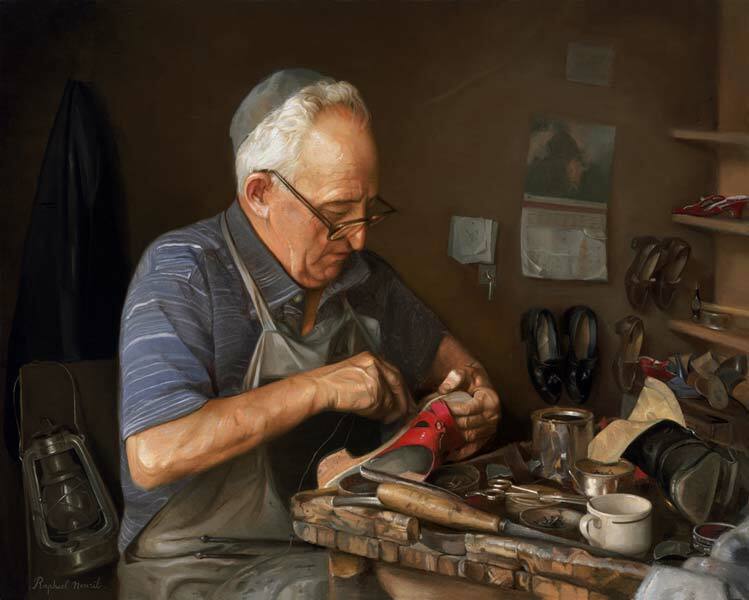 The face of each immigrant was carefully chosen by the artist from among actual Holocaust survivors or their children, including the original captain of the Exodus ship. 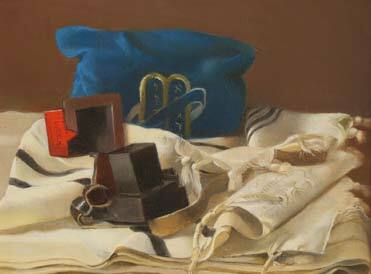 This painting was exhibited at Yeshiva University Museum, New York 1998 marking the State of Israel's 50th birthday. 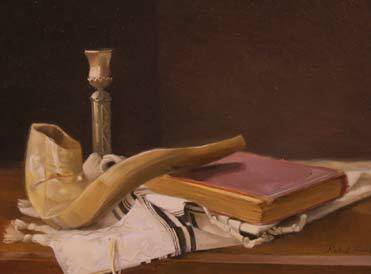 Raphael has always been fascinated by certain elements of The Priestly Blessing (Bircas Cohenim): the words they are saying, the way they stretch out their arms while reciting, the way in which the congregation must cover their heads with talleisim and for the Kabbalistic reasons of not looking at the Cohenim during the recitation. 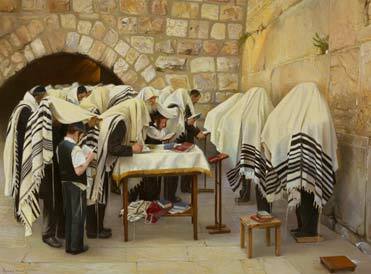 The artist found this blessing particularly elevating one early morning at the Kotel (Western Wall). He did not use too many colors in this painting in order not to take away from the spirituality and magical atmosphere of his painting. The warmth of color is radiating from the stones of the Kotel. This elevating and joyous ceremony leaves an impression on everyone's heart. 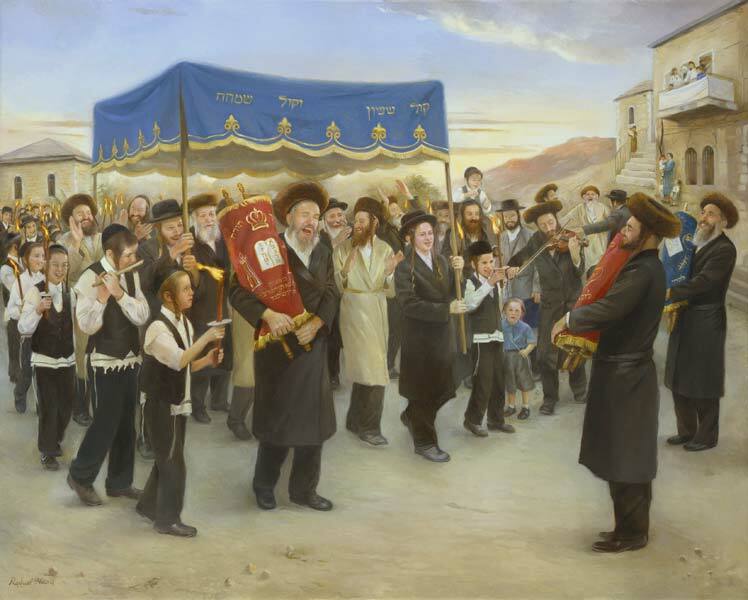 When one dedicates a Torah scroll to a synagogue, it is escorted from his house to the synagogue under a canopy surrounded by joyous members of the community singing and dancing in unison. 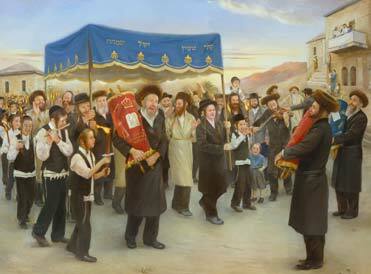 Children, too, participate in the festivities by holding lit torches alongside the procession. 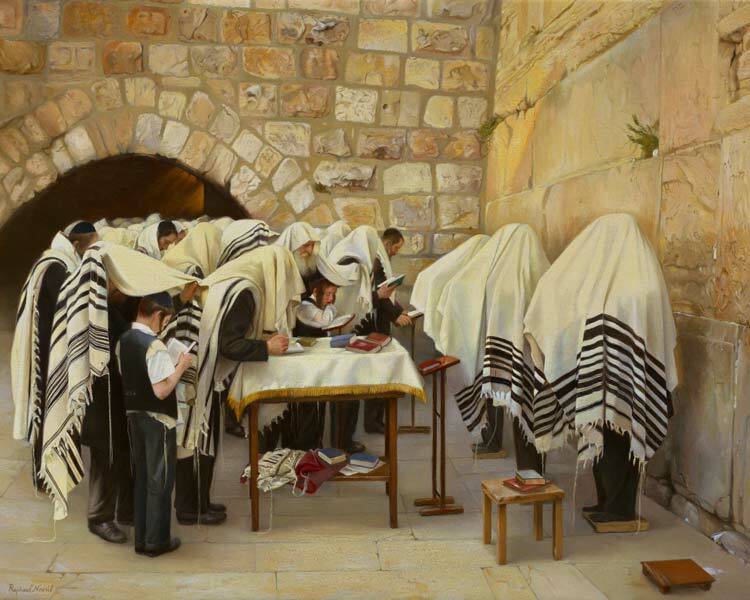 One of most elevating parts of this ceremony for Raphael is at its conclusion when the new Torah scroll is greeted by all the existing scrolls housed in the synagogue. Raphael has painted two paintings of such a ceremony, both taking place in old Jerusalem. 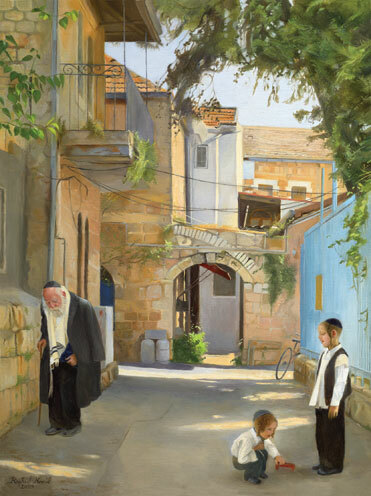 In the background, the artist has painted some of the ancient buildings of Jerusalem including the Batei Rand in Nachlaot. 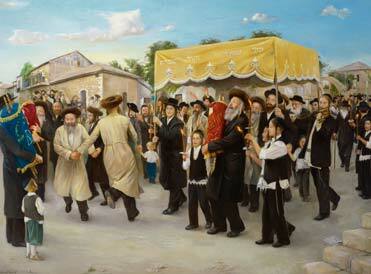 Raphael traveled to Jerusalem in 2003 especially to be at the Kotel during the festival of Sukkos. 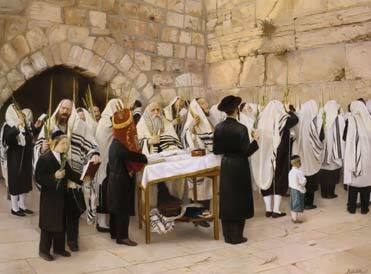 He was fascinated to see the Chassidim at the early morning prayers in front of such an ancient, holy wall. 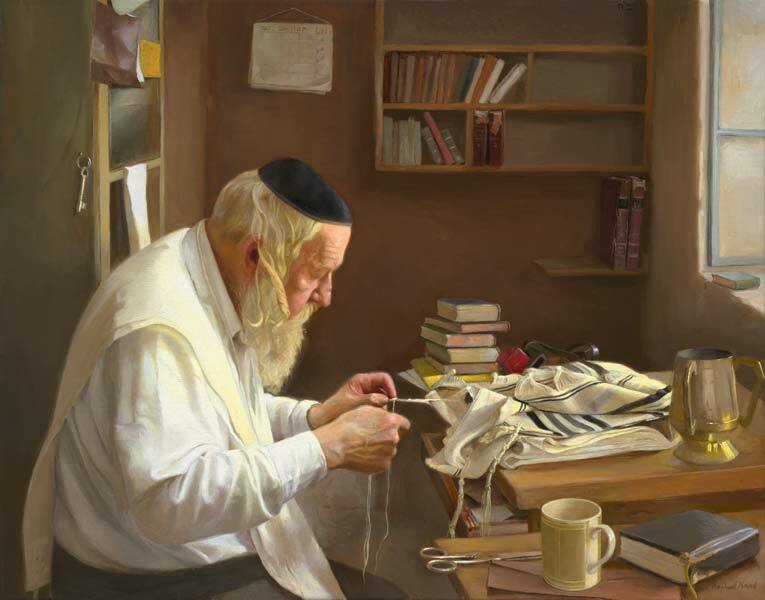 In Jerusalem, he made some color sketches and brought them back to London with him where he put them together for his painting. 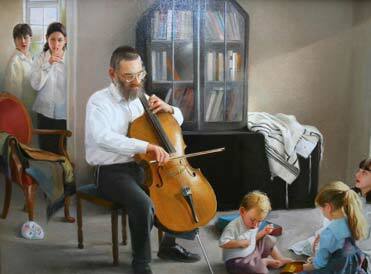 The same time the following year he went back to the Kotel and put his final touches on the painting. 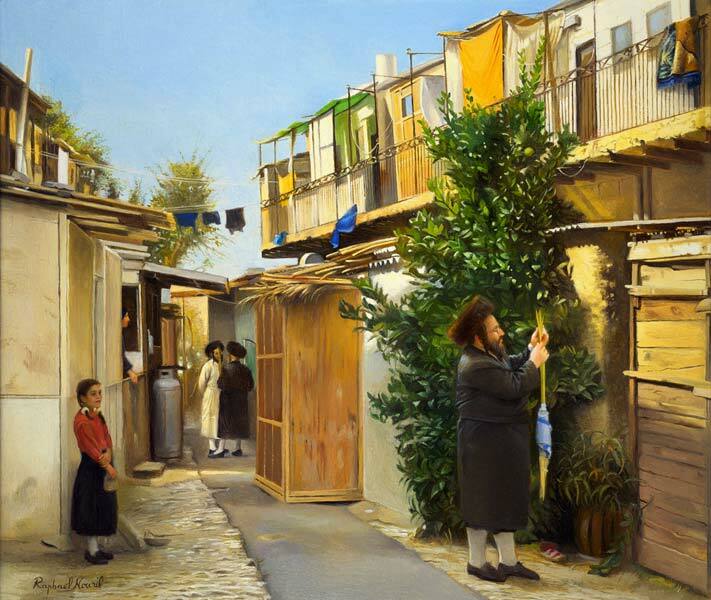 This painting is based on a scene that stayed in Raphael’s mind from the Tzemach Tzeddek synagogue in the Old City of Jerusalem. 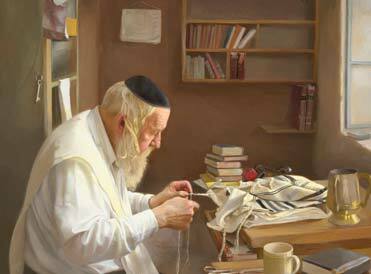 He always wanted to paint this scene because he loved being in synagogue on Shabbos morning every week and couldn’t help but look forward to the lifting of the Torah scroll. This elevating and joyous ceremony leaves an impression on everyone's heart. 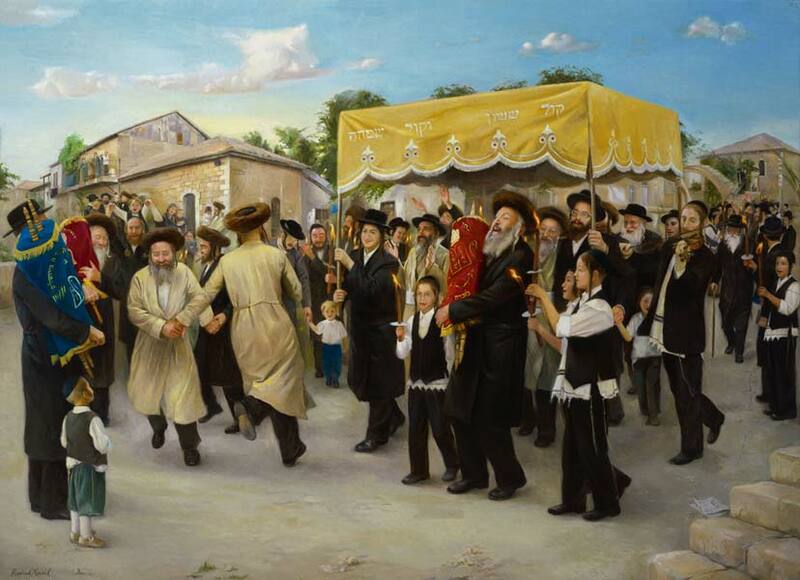 When one dedicates a Torah scroll to a synagogue, it is escorted from his house to the synagogue under a canopy surrounded by joyous members of the community singing and dancing in union. Children, too, participate in the festivities by holding lit torches alongside the procession. 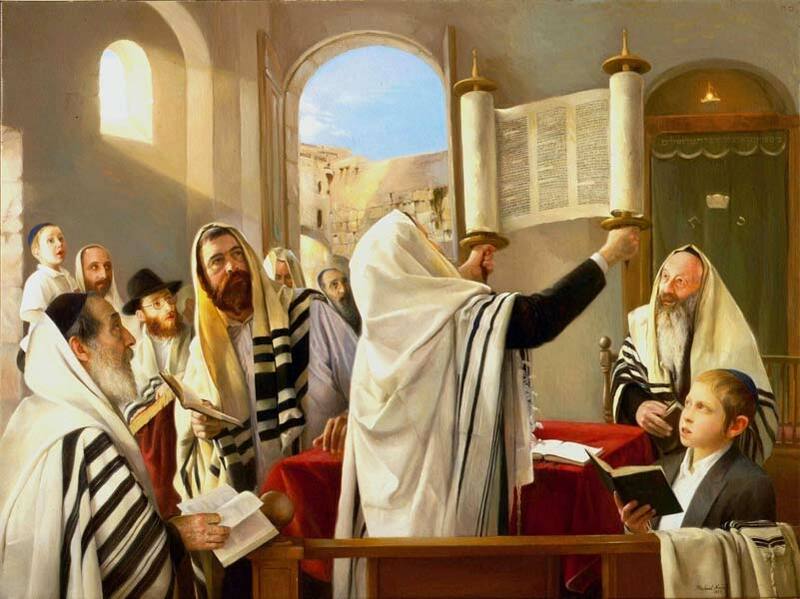 One of most elevating parts of this ceremony for Raphael is at its conclusion when the new Torah scroll is greeted by all the existing scrolls housed in the synagogue. 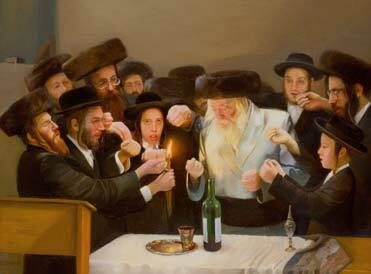 Raphael has painted two paintings of such a ceremony, both taking place in old Chassidic Jerusalem at twilight. One warm, sunny day during the festival of Sukkos in Jerusalem, the artist was sitting in an old, peaceful Chassidic courtyard. He enjoyed studying the scene of the sun shining over the communal balcony with colorful sukkot lined up. He wanted to capture the warm colors against the blue sky, a festival of colors within a festive neighborhood. He’ll never forget how the children in the courtyard became his art critics! 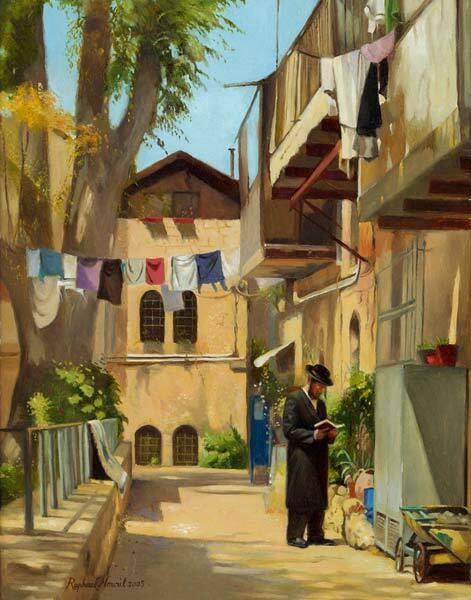 In a narrow, backstreet of Jerusalem, under the shadow of old buildings, the artist was sitting behind his easel and painting the symbolism of the light at end of the road. 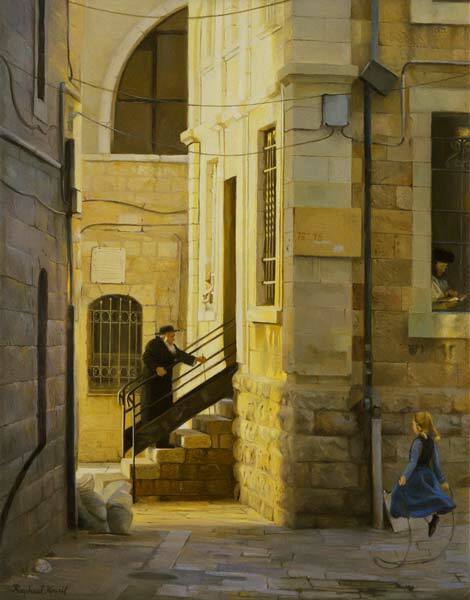 In this painting he went a step further and has shown the contrast in three different aspects: contrast between light and dark, contrast between cold and warm colors, and the contrast in human age and strength between an elderly man making an effort to climb the steps to the synagogue and a little girl jumping rope with ease. 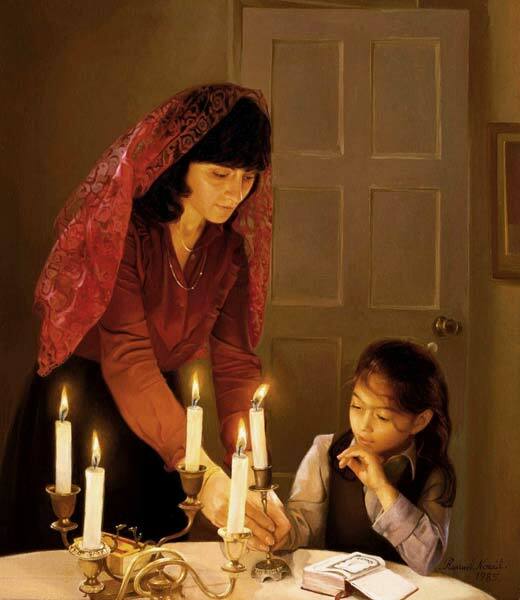 Raphael was inspired to see his family starting to light Shabbat candles. The calmness and prayer over the Friday night candles inspired the artist so much that he could only express his feelings through the creation of this painting. 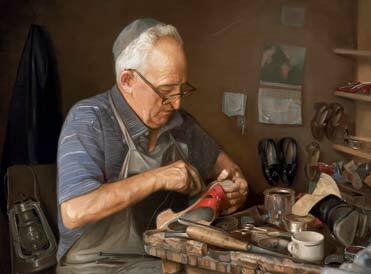 This painting is small but full of magnificent attention to detail. It has been painted by candle light with very fine brush strokes. 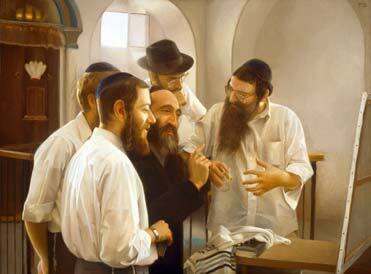 When Raphael visited the Tzemach Tzedek Shul in Jerusalem in 1985, he took the first Portrait of the Rebbe with him. 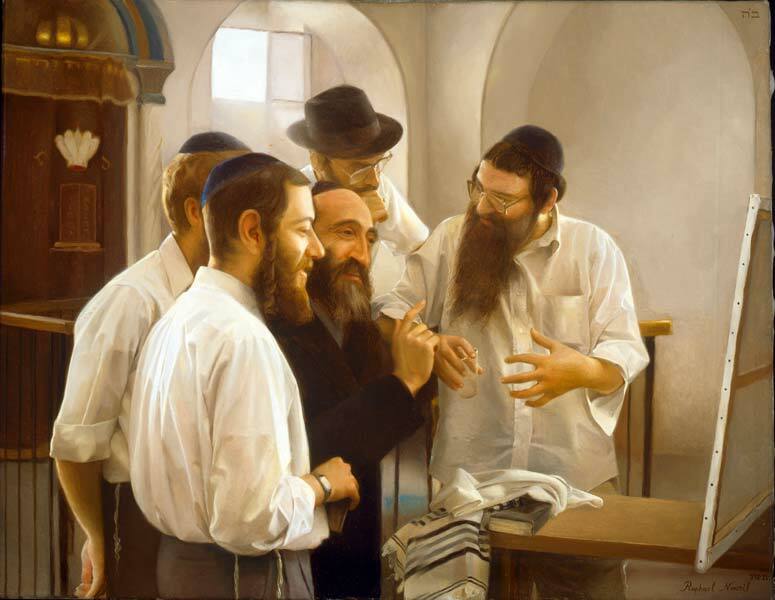 Everybody was waiting to see the painting and when he unveiled it, there was tremendous enthusiasm, as if the Rebbe himself had arrived to the room. The Rabbi of the shul (synagogue) gathered around the painting with his students and Raphael had never seen such excitement and commotion in his life. 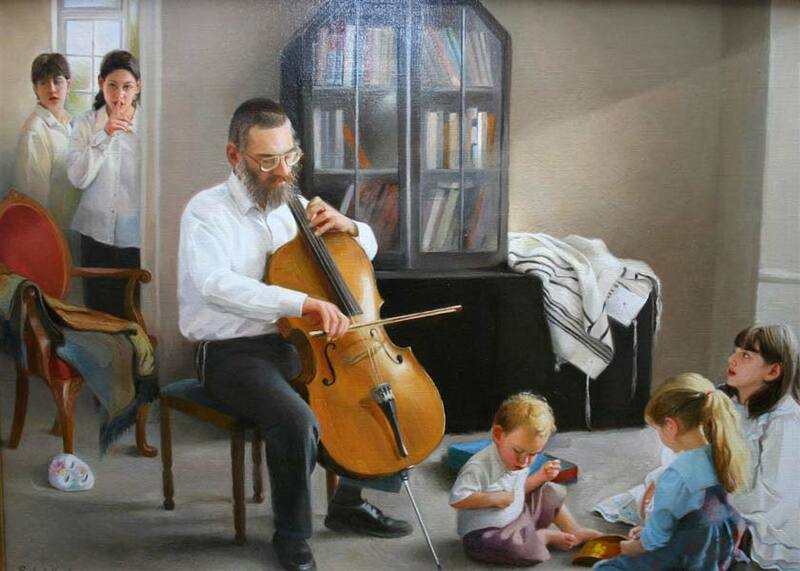 His wife Esther suggested that he capture this scene on canvas. While she was still speaking to him, Raphael had already started the painting in his mind, inspired by the spectacle around him. 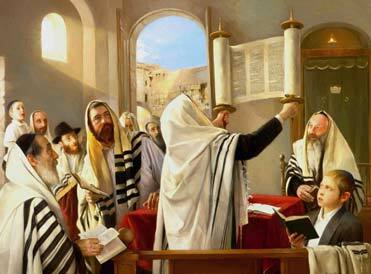 Tzemach Tzedek Shul was created. 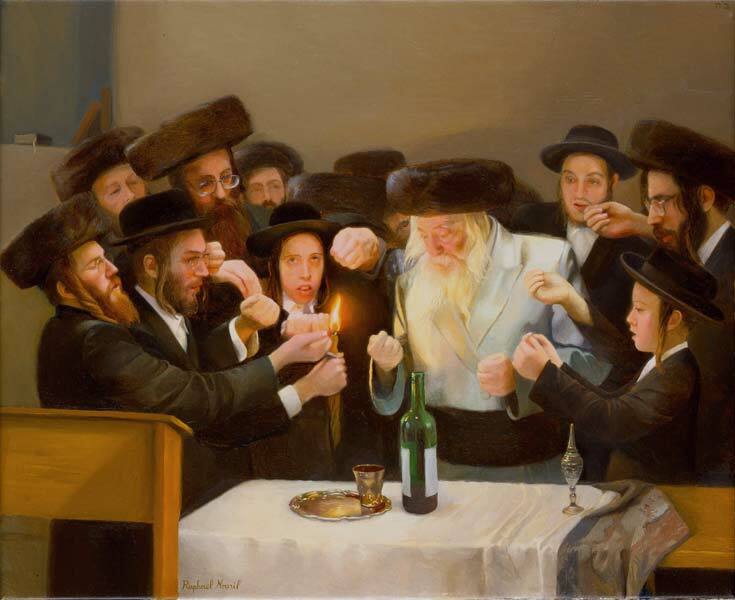 When Raphael went to his Lubavitch synagogue one evening in 1995, he noticed an old Russian chassid, Mendel Futerfas, telling stories about his experiences in Siberia, having been imprisoned for spreading Yiddishkeit (Judaism). 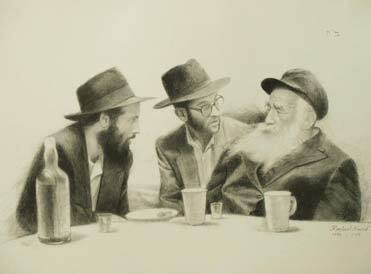 The young rabbis were mesmerized by every word he was saying and Raphael took notice of the atmosphere and the contrast between old and young. He decided to make sketches at the sight and later transformed them into the drawing seen here. 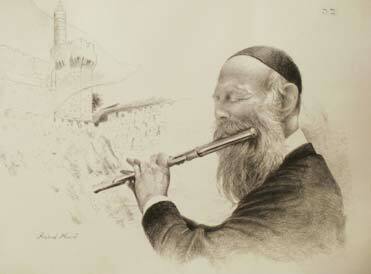 When Raphael was visiting the city of Tsfat, he met a religious man playing the flute. He approached the man and asked him with a smile, “You are a religious man. 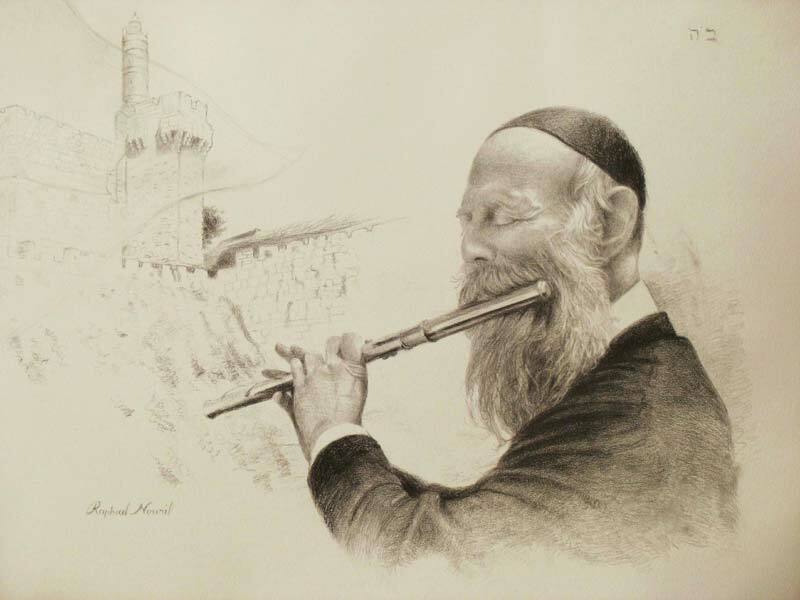 Why are you playing the flute instead of learning Torah?” The man answered, “My friend, I am praying.” This answer gave the artist his inspiration to make a drawing about the Final Redemption and the coming of Moshiach. In his drawing Raphael uses symbolism; since Moshiach is descendent from King David, we see the Tower of David in the background. Also, there is a veil of haze over the Tower of David, symbolizing that just one more sound from the Flute of Redemption can raise the veil that conceals the world and all Truth will be revealed.